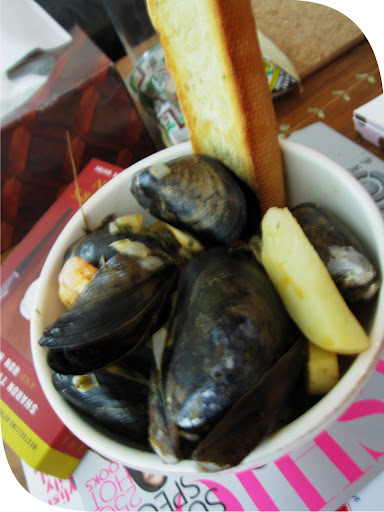 To ‘start’ – mussels, shrimp and potatoes in a white wine sauce. 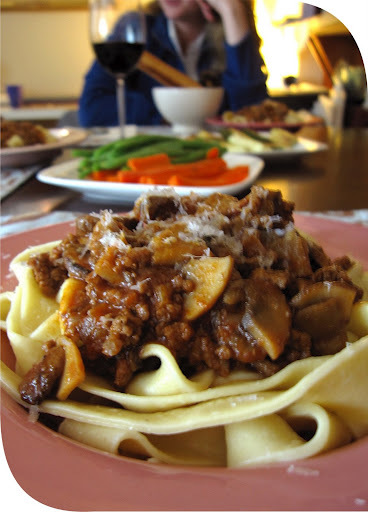 To ‘middle’ – homemade tagliatelle with cremini and beef ragu, served with a medley of grilled and blanched seasonal veg. To ‘end’ – Rocky Road ice cream. I’m afraid I didn’t have time to make the waffle bowls, but it was delicious all the same, and we were pretty full. I had a slightly comical experience making the pasta – I incorrectly guessed the recipe as 4 cups of flour and 4 eggs when in fact it is 2 cups of flour and 4 eggs. BIG difference! Lucky for me, I managed to catch my error in time and scooped up 2 cups of errant flour off my counter. I had some issues timing it all – I should have boiled the potatoes well ahead of time instead of trying to do it before the seafood went in. There was quite a delay. And as a result, my pasta water was ready to go – so first and second courses had to be served simultaneously. I love this picture (above), but I have learned that I really, really need to whip out my tripod more often. I tend to move around my food rather than angling the food for me – but shooting without flash means I sacrifice that lovely crisp sharpness. Anyway, another thing to test out for the next recipe. Moules, crevettes, pommes de terre et baguette. I just finished a lovely book featuring an American pastry chef living in Paris, so I’m liberally sprinkling my limited French vocab when I can. I’ve gotten a lot of great recipe ideas from the book so I’ll try and test a recipe out for y’all. He mentions chocolate…a lot. I’m having a craving for chocolate, GOOD chocolate (which can be hard to find). The best I’ve ever had was from a now-closed place called JS BonBons. I was gifted a box for a birthday and I always stopped by when I was in town (Toronto). Unfortunately, the lovely Jenn Stone has moved on to another project (I hope!) and as taken the best sea salt caramels with her. And the white chocolate lemon and thyme truffles. I’ll never forget you. I remembered that I have some Scharffen Berger goodies in my baking pantry and I took my sampler box back into my office and as I opened a carefully wrapped piece of milk chocolate, I (literally) moaned in delight – the chocolate was still perfect, ‘un-bloomed’ and crunchy. Oh lordy. ← I’m not done with you, my sweet.